Dorsal view of a remipede from the Bahamas. Photo courtesy of Thomas Iliffe (Texas A&M). The Remipedia are a small crustacean group. Its members consist of a handful of living species and a single fossil. Living representatives of this group, called the Nectiopoda, were not found until the early 1980's and there are still only seven species described to date from the Caribbean Sea and Australia. They are most often found in deep caves connecting to the sea, which serves as a source of the saltwater they live in. Enantiopoda, the fossil member of this group (Tesnusocaris goldichi), is from the lower Pennsylvanian (Paleozoic, Carboniferous), Tesnus Formation, Texas. Remipede bodies are divided into a cephalon (head) and elongate trunk with up to 32 similarly shaped segments. All known living remipedes except Enantiopoda lack eyes. The appendages on the trunk segments are paddle-like and directed out to the side. This appendage orientation is unusual in crustaceans, and it makes them superficially similar to polychaete worms (Annelida). Remipedes swim on their backs similar to the Anostraca (fairy shrimp). There remains much to learn about the biology of these unusual animals. Brooks, H. K. 1955. A crustacean from the Tesnus Formation of Texas. Journal of Paleonology. 29: 852-856. Yager, J. 1981. Remipedia, a new class of Crustacea from a marine cave in the Bahamas. Journal of Crustacean Biology. 1: 328-333. Yager, J. and W-F. Humphreys. 1996. Lasionectes exleyi, sp. 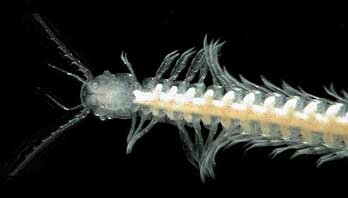 nov., the first remipede crustacean recorded from Australia and the Indian Ocean, with a key to the world species. Invertebrate Taxonomy. 10(1): 171-187.